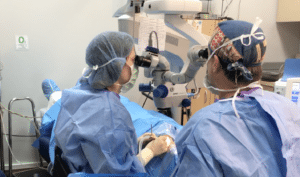 SoCal Eye is one of the few private ophthalmology practices that operates its own surgery center. This allows us to offer a safe, convenient, high-quality alternative to inpatient hospitalization. With state-of-the-art technology and monitoring, and board-certified anesthesiologists, the SoCal Eye surgery center is certified by Medicare and approved by most insurances. Our skilled staff is known for its expertise and for providing service in a friendly, caring environment. A personal Registered Nurse is assigned to each patient and accompanies him/her throughout the entire procedure.